Inspired by the City of Montreal’s freshly inaugurated ‘River to Mountain Walkway’ path, we’ve designed a guided urban walk that brings you from the cobblestone streets of historic Old Montreal, through the surprisingly green downtown core, picturesque McGill University, and finally to the top of the forested Mont-Royal Park and its spectacular lookout! 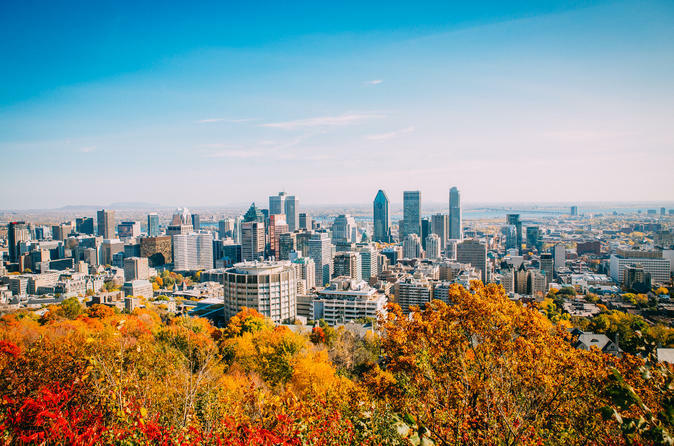 Inspired by the City of Montreal’s freshly inaugurated ‘River to Mountain Walkway’ path, we’ve designed a guided urban walk that brings you from the cobblestone streets of historic Old Montreal, through the surprisingly green Downtown core, picturesque McGill University, and finally to the top of the forested Mont-Royal Park and its spectacular lookout (A Montreal must-do photo-opportunity!). We use the City’s walkway path as our baseline route, but add a ‘Fitz & Follwell’ twist to take you off-route, down back streets, to discover hidden parks, admire special architecture, and storytell along the way. This is a tour that both locals and visitors will appreciate. During the winter season we adapt our tour to offer many indoor passages and bathroom breaks. The tour is 3 hours long including the walk up to the Mont-Royal Observatory (optional). The tour ends at the summit of the mountain from which participants can take a bus or cab back down to the city. For those that prefer to skip this part, the tour takes about 2.5 hours and ends at Rutherford park on McTavish street.